How do email blacklists work? Email blacklist is a dark, murky place for those who have been caught red-handed spamming. But in some cases, you may get yourself on a blacklist out of unawareness or by accident. To find out the reason behind it, you need to learn how blacklists work first. Blacklisting is like putting a finger at spammers. It’s a process of identifying the IPs and domains that are used to send out mass email spam and compile them on a list. If the recipient’s email or internet service provider uses blacklists, the IP of each incoming email sender is checked against such a list. It works kinda like a bouncer in a club who checks each entering person against a guest list. If the IP happens to appear on a blacklist, the email is rejected and never gets delivered to the recipient’s inbox. Then, the email goes through a spam filter. If everything is ok, a spam filter gives the email a green light to reach its destination, namely the recipient’s inbox. If the email looks suspicious to the spam filters, it is flagged as spam and finds its miserable end in the spam filter or may be bounced. How a blacklist database is built? Blacklists build their database based largely on the spam reports. Every time an email is marked as spam either manually by a human or automatically by a spam filter, a note is given to a blacklist. The sender collects yellow cards. Once there are enough complaints to meet the blacklist criteria, sender’s IP or domain gets blacklisted. The sender finally receives a red card. Another way of landing on one of the infamous lists is when someone sends a personal request to blacklist certain IPs or domains. Such a request must be accompanied with a proper justification or proof that a sender is a notorious spammer. One more factor that determines whether an IP address or domain should be blacklisted is a high bounce rate. Both email service and internet service providers monitor sender’s bounce rate as it is often connected with spamming activity. That’s why it’s so important to maintain an up-to-date and high-quality email list. If the bounce rate stays at a high level, the email or internet service provider tips off a blacklist. You know the end of the story. Last, but not least, the email engagement level plays a huge role in determining email sending reputation. The way the recipients interact with the emails gives an email service provider a sign that the messages are either welcome or unwanted. If the emails are being opened, read and replied to, the sender doesn’t raise any suspicion. On the contrary, if all the emails get deleted without being opened or there are no replies, that’s enough to raise a red flag. Although not all the email providers take the engagement level into account when assessing user’s sending reputation, it’s better to keep it in mind and make sure your emails get prospects’ interest. But I’m not a spammer. Why have I been blacklisted then? Very often senders unintentionally keep getting red cards resulting in being blacklisted due to their wrong approach to sending emails at scale. What are the most serious mistakes? For example, sending to unverified email addresses, not taking enough care of the email database quality, extremely high volume of outcoming mail, the lack of personalization or using spam words. Each blacklist has its own criteria for red-flagging an IP. Usually, the reason is not a secret and you can check it on a blacklist’s website. Most often the cause is technical or policy-based. How to find out whether I’m on a blacklist? If you notice that your open rate has dropped down, it’s a sign that you might have been blacklisted. In some cases, your email or internet service provider may notify you that you got blacklisted, but usually, you have to do a manual check. There are 3 kinds of places where you can check whether your domain or IP has been blacklisted. It’s worth noting that being listed on Spamhaus means the things got serious. The Spamhaus project is one of the oldest and most renowned organizations that tracks spammers. You should make an extra effort to get yourself unlisted. You have to make a removal request stating the nature of your business and proving you’re not a spammer. Once your request is approved, you will receive a removal confirmation email. The whole process takes up to 24 hours. Another way to find out if your IP is listed on the most popular blacklists is to run the Mail Tester check-up. However, not all the blacklists mentioned by the tool are equal. Some of them, like SORBS-SPAM, SORBS-DUHL, BACKSCATTERS or China Anti-Spam Alliance are of low importance and can be ignored. How to get your IP removed from a blacklist? If you found out that your email server IP or domain appear on any of the infamous lists, your first step should be to check the unlisting process for a particular blacklist. Sometimes all you have to do is prove you’re not a bot or follow other self-service procedures. However, before doing that, make sure you identified and removed the reason for which you landed on a blacklist. In other instances, you need to send an unlisting request to blacklist owners explaining the whole situation. You might need to do it via email or fill out a special form. Some blacklists do not have an unlisting process. Instead, they remove your IP automatically after a set period of time, provided you stop acting like a spammer. 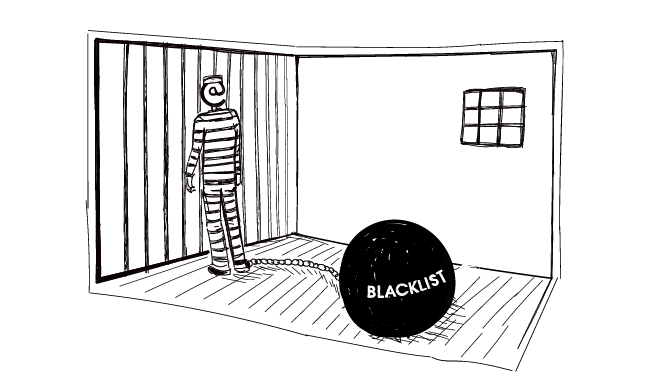 Remember that being removed from a blacklist is like parole. Your email sending behavior is under close observation. Make sure you remove the reason for which you got blacklisted before you start sending emails again. Is getting off the blacklist enough to regain good deliverability? Not quite so. In fact, it’s just the beginning of a long recovery process. You need to rebuild your IP or domain reputation from bad to good. The procedure looks similar to warming up a brand new domain, except that you have a longer way to go because this time you start off with a negative, not neutral, label. Begin with sending just a handful of emails a day, preferably to your friends and family. Ask them to reply to your messages, so the conversation looks natural. If your email lands in the spam folder, ask the recipients to unmark it as spam. This way the spam filters note that your emails are legitimate and relevant to the recipients. Additionally, think about what actions might have resulted in you being blacklisted. Did you send too many emails in a very short period of time? Was your message relevant to the target group? Was your prospect list up-to-date? Did you have a high hard bounce rate? Analyze, draw conclusions and work on improving your future campaigns. If you stay consistent with the recovery process and keep away from a spam-like activity, your email server IP and domain reputation will slowly but surely improve with time. What steps should I take to keep away from blacklists? Use only the email list that is verified and up-to-date. Make the emails relevant to the recipient – get to know your prospects needs and pain points to hit the sweet spot with your message. Don’t copy and paste ready-made templates that you found on the internet – sending the same message over and over again looks spammy. Instead, use an extra level of personalization to add a unique touch to each email. Take care of proper formatting and spelling. People tend to judge the book by its cover and may manually report your email as spam, just because the text looks messy. Avoid spam words. Check your email copy against this list. Do not overdo with the volume of emails you send at once. Segment your prospects into groups of 30-50 and go for smaller, highly targeted campaigns. Mind you that tracking may lower your deliverability. However, if you want to use open or click tracking, the safest solution is to set up your own custom tracking domains. By default, the tracking domains set in Woodpecker are SSL enabled. Make your email signature as simple as can be: if possible, don’t include any links, photos, and numbers, including the telephone number. If you ever happen to land on a blacklist, find out the reason behind it and remove the cause. Most likely you did not take enough care of either the quality of your email copy or you ignored some technical aspects lying behind your low deliverability rate. Fix the content of your emails and make sure you keep in mind these 14 deliverability checks.